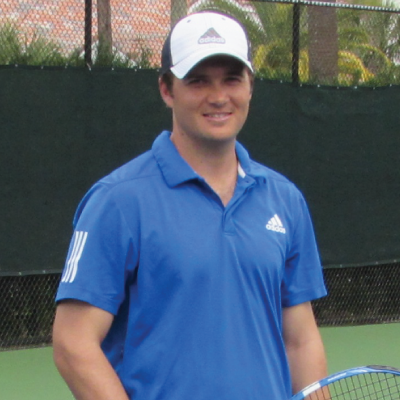 Gregg le Sueur has been a professional tennis instructor for ten years, certified through the USPTR. For the past four years, he has been working with ABCDEF, the world’s premier tennis management company. Gregg’s training and experience includes tennis instruction for all abilities: novice, intermediate and advanced levels of play, as well as running social programs, clinics, and tennis charities. Through ABCDEF, Gregg has completed 450 hours of training on tennis instruction, court maintenance, service, and club/resort tennis management. During this time, Gregg has also spent many hours studying teaching concepts and instruction with , a USPTA Master Professional, retired touring pro, and former coach of and . Gregg’s most recent experience has been as the Director of , and . At these locations Gregg coached both junior’s and adult league teams, and was responsible for scheduling, promoting, and running a wide variety of programs, which included lessons, clinics, cardio tennis, interclub match play, and social events.